The neutrophil-to-lymphocyte ratio (NLR) is an independent factor for overall survival (OS) in patients with metastatic melanoma, whether they receive targeted therapy or immunotherapy. In a retrospective analysis performed in patients treated at a single institution, OS was markedly improved in patients with an NLR <5 at a median of 14.8 months compared with those who had an NLR >5, in whom the median OS was 5 months, according to research presented by Elizabeth Blackley, MD, at the 2017 ESMO Congress. An elevated NLR had already been shown to be a poor prognostic marker in many solid tumors, including melanoma. 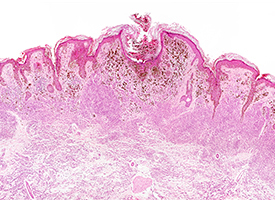 Previous literature had confirmed that NLR was a prognostic marker in patients with melanoma who were treated with the CTLA-4 inhibitor ipilimumab (Yervoy) and predicted progression-free survival in patients treated with immune checkpoint inhibitors. Blackley and colleagues sought to assess NLR as a marker of prognosis independent of traditional prognostic features in patients with metastatic melanoma receiving targeted therapy and immunotherapy. They examined the utility of NLR as a prognostic factor in 152 patients with stage IV melanoma who received at least 1 dose of first-line targeted therapy (n = 74) or immunotherapy (n = 78) from August 2010 to July 2017. Standard-of-care therapies were used in 55% of patients, which included a single-agent PD-1 inhibitor in 21.1% overall, a combination of PD-1/CTLA-4 inhibitor in 3.9%, and a combination of a BRAF- and MEK-targeted agents in 30.9%. Prior standard-of-care regimens were used in 45% (single-agent BRAF or MEK inhibitor in 17.8% and single-agent CTLA-4 inhibitor in 26.3%). The baseline NLR was calculated from neutrophil and lymphocyte counts immediately prior to treatment. Median follow-up was 33 months, with only 4 patients lost to follow-up. NLR was analyzed as a categorical variable above and below 5. A total 104 (68%) patients had an NLR <5 and 48 (32%) had an NLR >5. The improvement in OS in the group with NLR <5 corresponded to a hazard ratio of 0.51 (P = .001). When the results were stratified for those receiving current standard-of-care therapies versus superseded regimens, OS with standard-of-care regimens extended to 17.7 months, with follow-up ongoing. When OS was broken down by agent received, an NLR <5 remained a strong indicator of favorable prognosis compared with NLR >5 in patients treated with either targeted therapy (HR, 0.51; P = .05) or immunotherapy (HR, 0.44; P = .008). On multivariate analysis that included NLR, gender, melanoma stage, central nervous system metastases, liver metastases, level of lactate dehydrogenase (LDH), and age, NLR was the strongest predictor of OS, with an HR of 0.43 (P = .0003). The baseline ECOG performance status was documented in 119 of 152 patients (78%). Of these 119, (92%) had a performance score of 0 or 1, 6% were ECOG 2, and 2% were ECOG 3, making it unlikely that the results were confounded by a high proportion of patients with poor performance status. When analyzed as a continuous variable, NLR remained significant as the most prognostic factor of OS (P = .0003). Multivariate analysis by treatment group confirmed NLR as the most significant predictive factor in patients receiving immunotherapy (HR, 0.28; P =.001) and second to LDH in targeted therapies with (HR, 0.33; P = .001). The value of NLR may lie in selecting candidates for intensive treatment, said Blackley, whereas patients with a more favorable NLR may be candidates for single-agent PD-1 inhibition or dual BRAF-/MEK- targeted therapy or perhaps sequential rather than combination immunotherapy. Blackley E, Lim LE, Moore M, et al. Neutrophil to lymphocyte ratio (NLR) as an independent prognostic measure in patients receiving targeted therapy or immunotherapy for stage IV melanoma. In: Proceedings from the 2017 ESMO Congress; September 8-12, 2017; Madrid, Spain. Abstract P1242.